A recent market study published by the company “Cutaneous and Systemic Leishmaniasis Market: Global Industry Analysis 2013–2017 & Forecast, 2018–2028” consists of a comprehensive assessment of the most important market dynamics. After conducting thorough research on the historic as well as current growth parameters of the cutaneous and systemic leishmaniasis market, the growth prospects of the market are obtained with maximum precision. The report features the unique and salient factors that are likely to significantly impact the development of the cutaneous and systemic leishmaniasis market during the forecast period. It can help market players modify their manufacturing and marketing strategies to envisage maximum growth in the cutaneous and systemic leishmaniasis market in the upcoming years. The report provides detailed information about the current and future growth prospects of the cutaneous and systemic leishmaniasis market in the most comprehensive manner for the better understanding of readers. 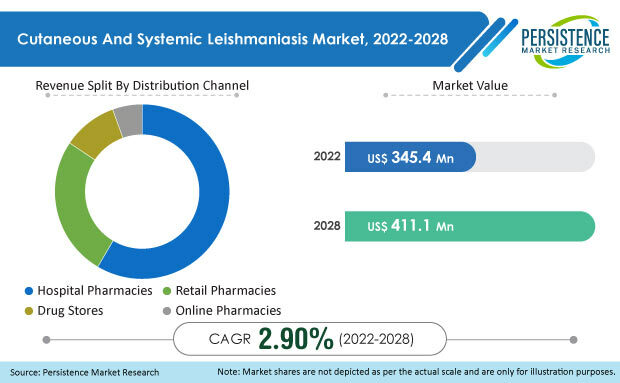 The report commences with the executive summary of the cutaneous and systemic leishmaniasis market, which includes a summary of the key findings and key statistics of the market. It also includes the market value (US$ million) estimates of the leading segments of the cutaneous and systemic leishmaniasis market. Readers can find the detailed taxonomy and the definition of the cutaneous and systemic leishmaniasis market in this chapter, which will help them understand the basic information about the cutaneous and systemic leishmaniasis market dynamics, supply chain, cost structure, and pricing analysis. A list of key distributors and suppliers, as well as a list of the key market participants is included in the report. The report provides key market trends that are expected to impact the market growth significantly during the forecast period. Detailed industry trends are provided in this section, along with new treatment approaches or product innovations. This section includes the key inclusions of the report. It includes the regulatory scenario, disease epidemiology, pipeline assessment, and reimbursement scenario for each region. This chapter includes a detailed analysis of the macroeconomic factors, forecast factors, market dynamics, such as the drivers and restraints of the market, and an opportunity analysis. This chapter includes the detailed analysis of the historical cutaneous and systemic leishmaniasis market, along with an opportunity analysis of the future. Readers can also find the absolute opportunity for the current year (2018 – 2019), and the incremental opportunity for the forecast period. Based on the type, the cutaneous and systemic leishmaniasis market is segmented into pentavalent antimonials, antifungal drugs, and anti-lesihmanial/antimicrobial drugs. In this chapter, readers can find information about the key trends and developments in the cutaneous and systemic leishmaniasis market and market attractiveness analysis based on the drug class. Based on the route of administration, the cutaneous and systemic leishmaniasis market is segmented into oral, injectable, and topical. In this chapter, readers can find information about the key trends and developments in the cutaneous and systemic leishmaniasis market and market attractive analysis. Based on the indication, the cutaneous and systemic leishmaniasis market is segmented into cutaneous leishmaniasis, mucosal leishmaniasis, and visceral leishmaniasis. In this chapter, readers can find information about the key trends and developments in the cutaneous and systemic leishmaniasis market and market attractive analysis based on indication. Based on the distribution channel, the cutaneous and systemic leishmaniasis market is segmented into hospital pharmacies, retail pharmacies, drug stores, and online pharmacies. In this chapter, readers can find information about the key trends and developments in the cutaneous and systemic leishmaniasis market, and market attractiveness analysis based on the distribution channel. This chapter explains how the cutaneous and systemic leishmaniasis market will grow across various geographic regions, such as North America, Latin America, Europe, Asia Pacific Excluding Japan, Japan, Oceania, and the Middle East & Africa (MEA). This chapter includes a detailed analysis of the growth of the North America cutaneous and systemic leishmaniasis market, along with a country-wise assessment that includes the U.S. and Canada. Readers can also find the regional trends, regulations, and market growth based on the end users and countries in North America. Readers can find detailed information about several factors, such as the pricing analysis and the regional trends, which are impacting the growth of the Latin America cutaneous and systemic leishmaniasis market. This chapter also includes the growth prospects of the cutaneous and systemic leishmaniasis market in the leading LATAM countries such as Brazil, Mexico, Argentina, and the Rest of Latin America. Important growth prospects of the cutaneous and systemic leishmaniasis market based on its end users in several countries, such as Germany, the UK, France, Spain, Italy, BENELUX, NORDIC Countries, Russia, and the Rest of Europe, are included in this chapter. In this chapter, China, India, ASEAN and South Korea are the leading countries in the APEJ region, which are the prime subjects of assessment to obtain the growth prospects of the APEJ cutaneous and systemic leishmaniasis market. Readers can find detailed information about the growth parameters of the APEJ cutaneous and systemic leishmaniasis market during the period 2018–2028. Readers can find important factors that can significantly impact the growth of the cutaneous and systemic leishmaniasis market in Japan during the forecast period based on the market segmentation. In this chapter, Australia and New Zealand are among the leading countries in the Oceania region, which are the prime subjects of assessment to obtain the growth prospects of the Oceania cutaneous and systemic leishmaniasis market. This chapter provides information about how the cutaneous and systemic leishmaniasis market will grow in the major countries in the MEA region, such as North Africa, GCC Countries, South Africa, and the rest of MEA, during the period 2018–2028. In this chapter, readers can find a comprehensive list of all the leading stakeholders in the cutaneous and systemic leishmaniasis market, along with detailed information about each company, which includes the company overview, revenue shares, strategic overview, and recent company developments. Some of the market players featured in the report are GlaxoSmithKline plc. ; Gilead Sciences, Inc.; Profounda Pharmaceuticals; Knight Therapeutics Inc.; Janssen Global Services, LLC; Albert David Ltd; Jubilant Life Sciences Ltd; Novartis AG; Sanofi A.G; and Bristol-Myers Squibb Company among others. This chapter includes a list of acronyms and assumptions that provide a base to the information and statistics included in the cutaneous and systemic leishmaniasis report. This chapter helps readers understand the research methodology followed to obtain the various conclusions as well as important qualitative and quantitative information about the cutaneous and systemic leishmaniasis market. In the past decade, various organizations have taken substantial efforts to control the pathogenesis of cutaneous and systemic leishmaniasis Moreover, new diagnostic as well as prognostic parameters have been set to make the treatment of cutaneous & systemic leishmaniasis easier and more efficient. In addition, several tropical regions around the world have adopted preventive measures to control the pathogenesis of cutaneous & systemic leishmaniasis. For example, vector control strategies have been adopted in the APEJ region, and preventive measures, such as indoor residual spraying, long-lasting insecticidal nets, and environmental management, are being implemented through healthcare programs for controlling the spread of cutaneous & systemic leishmaniasis. According to WHO, indoor residual spraying is the main intervention for the elimination of visceral leishmaniasis in the APEJ region. However, more recently, initial resistance to DDT (dichlorodiphenyltrichloroethane) has been found among the pathogens that spread cutaneous & systemic leishmaniasis and therefore, countries such as India, Bangladesh, and Nepal have recently shifted to synthetic pyrethroids for disease treatment. Over the years, a combination of different cutaneous & systemic leishmaniasis drugs have revealed high rates of successful treatment among the random cutaneous and systemic trail groups that have been treated with medications. Among the various combinations that were put under trial, meglumine antimoniate plus granulocyte-macrophage colony-stimulating factor and meglumine antimoniate plus imiquimod were found to have a cure rate of 100% for cutaneous & systemic leishmaniasis. Hence, it is estimated that combinational drug therapy using different doses of pentavalent antimonials, antifungals, and antileishmanial drugs will be the most preferable treatment for cutaneous & systemic leishmaniasis. Various manufacturers operating in the cutaneous & systemic leishmaniasis market are investing heavily to introduce novel treatment options. Furthermore, a number of medications and drugs for the treatment of cutaneous & systemic leishmaniasis are in different stages of pipeline trials, and majority of these trial outcomes are estimated to be positive. These efforts are likely to provide numerous opportunities for the treatment of cutaneous & systemic leishmaniasis. Over the years, there has been an increase in the government spending on healthcare infrastructure in most of the countries around the globe. This is estimated to propel the cutaneous & systemic leishmaniasis market. Although government-sponsored public reimbursement policies in the developing countries are mostly ineffective, private health insurance providers are rapidly making inroads for the smooth and effective treatment of cutaneous & systemic leishmaniasis. In the U.S, awareness about the management of tropical diseases, such as cutaneous & systemic leishmaniasis, is high. Moreover, individuals have the liberty to opt for the type of reimbursement policy, such as Medicaid or Medicare, which are likely to offer the maximum benefits. This section of the cutaneous & systemic leishmaniasis market report features the profiles of the key players operating in the cutaneous & systemic leishmaniasis market based on their marketing and differential strategies. Examples of some of the key players featured in this report include GlaxoSmithKline plc. ; Gilead Sciences, Inc.; Profounda Pharmaceuticals; Knight Therapeutics Inc.; Janssen Global Services, LLC; Albert David Ltd; Jubilant Life Sciences Ltd; Novartis AG; Sanofi A.G; and Bristol-Myers Squibb Company. The key manufacturers operating in the cutaneous & systemic leishmaniasis market are keen to implement new and differentiating strategies to meet not only product demand, but also dominate the regional market. These companies are focused on adopting new strategies and policies, such as increasing post sales & service agreements, effective technological & distributorship collaborations, promoting research & development for the development of products for the treatment of cutaneous & systemic leishmaniasis, continuous product lunches, joint ventures, partnerships, and mergers & acquisitions. What is the revenue potential of the cutaneous & systemic leishmaniasis markets across Latin America, APEJ, and MEA? Who are the key competitors and what are their portfolios in the cutaneous & systemic leishmaniasis market? What are the major challenges influencing the growth of the cutaneous & systemic leishmaniasis market? How is intervention from regulatory authorities shaping the growth of the cutaneous & systemic leishmaniasis market? The cutaneous & systemic leishmaniasis market has been estimated based on an epidemiology-based approach. The market was studied by estimating the base year market side in different region/countries. The market was estimated based on product dosage for treatment in the top 20 countries worldwide. Other qualitative factors analyzed during market value estimation include awareness about the usage of cutaneous & systemic leishmaniasis medications, which include product usage, regional product adoption, and the prevalence of cutaneous & systemic leishmaniasis. This information was further validated with rigorous primary research, which includes interviews, surveys, in-person interactions, and viewpoints of seasoned analysts, and secondary research, which includes verified paid sources, authentic trade journals, and resourceful databases. The research study on the cutaneous & systemic leishmaniasis market also includes the top trends and macro- as well as micro-economic factors shaping the cutaneous & systemic leishmaniasis market. With this approach, the report on the cutaneous & systemic leishmaniasis market estimates the industry attractiveness of every major segment in the cutaneous & systemic leishmaniasis market over the forecast period.